If you're like most people then you're probably short on sleep. 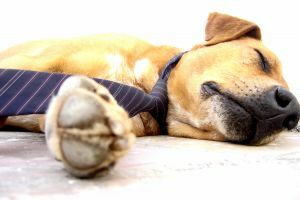 In a 2015 survey conducted by the National Sleep Foundation, Americans said they experienced 26 minutes less sleep than they preferred on work days.1 This should raise red flags for all of us, because getting enough sleep isn't something we should do just for the sake of doing, but is something we need to do in order to maintain optimal health. In fact, it rivals the importance of eating healthy and exercising regularly. Unfortunately, many of us take sleep—or the lack there of—for granted. We think we can survive on what is a dangerously low amount of sleep. If we spend a third of our life sleeping—and sleeping is essential for optimal health—then it's in our best interest to get really good at it, don't you think? Our body is practically begging us to do just that when we spend our days spacing out and drifting off into la-la land. Let's take a closer look at exactly what sleep does for us so we understand why it's so important. Chronic sleep deprivation, on the other hand, has a deleterious effect on human health. Regular sleep loss has been linked with an increase risk of hypertension, diabetes, obesity, depression, anxiety, heart attack, stroke, and alcohol use.3 These effects are seen when adults receive less than 7 hours a night of sleep on a regular basis. To learn more about how sleep effects your health read my article below. Have you ever heard of the term "biological clock"? This is the body's internal clock that helps regulate our circadian rhythms. Circadian rhythms are a 24-hour period of biological activity that our body experiences each day. We naturally like to sleep when it's dark and awake when it's light. Flying into a different time zone, working night shifts, or having a sporadic sleeping routine can disrupt your circadian rhythms. By establishing a regular sleeping routine where your bedtime and morning awakening times are the same you can help regulate your circadian rhythms. There are five different stages of sleep that make up a sleep cycle. Each sleep cycle lasts approximately 90-110 minutes. A person typically experience 4-5 sleep cycles during a full night of sleep. Stage 1 - Drowsiness. You drift in and out of sleep and are awakened easily. Stage 2 - Light sleep. Your eye movement stops, body temperature drops, and heart rate slows. Stage 3 & 4 - Deep sleep. No eye movement or muscle activity occurs at this time. If awakened you become extremely groggy and disoriented. Your body restores muscle tissue and strengthens the immune system during this stage. REM sleep - Dream sleep. This is where you expierence dreams. Your eyes move rapidly back and forth, heart rate and blood pressure rise, your breathing is rapid, shallow, & irregular, and your arms and legs become temporarily paralyzed keeping you from acting out your dreams. In this stage, you are able to process your emotions and memories as well as relieve stress. This a tough question because each individual may differ in how much sleep they need to function at their best. However, most adults need between 7 and 9 hours of sleep per night to meet their needs. 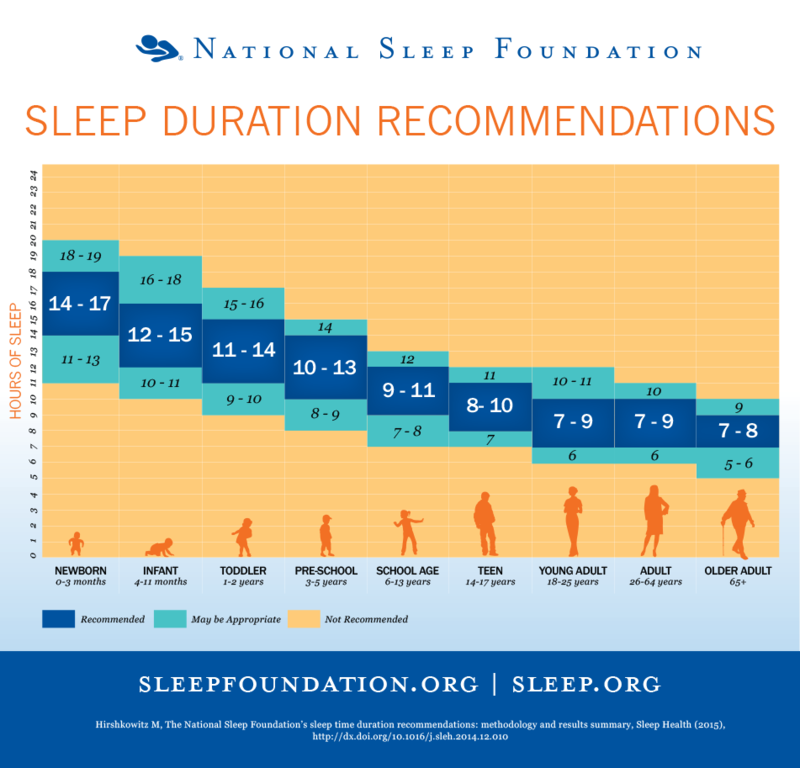 The chart below from the National Sleep Foundation outlines general sleep requirements for different age groups. 1) Follow a consistent sleeping schedule by going to bed and waking up at the same time everyday, including weekends. Remember, you don't want to disrupt your circadian rhythms, and having a regular sleep schedule will keep your biological clock in tune and functioning properly. 2) Make your bedroom cool, dark, quiet, and comfortable. You should create an environment that invites sleep, not inhibits it. Keep tv's and stereos out of the bedroom, do not use your electronic devices (smartphones, tablets, iPads etc.) in bed, cover any objects illuminating light, and make sure you have the proper amount of bedding for the time of year (winter, spring, summer, fall). 3) Finish eating and drinking 2 to 3 hours before bedtime. 4) Establish a relaxing pre-bedtime routine by listening to soothing music, reading a book, or taking a warm bath or shower. Make sure you have the lights dimmed down so your body understands it should be getting ready to sleep. 5) Exercise regularly. When you exercise on a consistent basis sleep will come much more easily and naturally. Make sure you complete your exercise routine at least 3 to 4 hours before going to bed. Your body needs time to wind down. 6) Avoid caffeine, nicotine, and alcohol. Caffeine is a stimulant which can lead to sleep deprivation. Alcohol tends to keep people from getting enough deep sleep or REM sleep. People who use nicotine products will typically awake earlier than others due to nicotine withdrawal. 7) Don't lie in bed awake for more than 20 minutes. If you can't fall asleep right away then get up and go back into your pre-bedtime relaxing routine. Agonizing over not being able to sleep will only increase your stress level and contribute to insomnia. 8) Evaluate your mattress and pillows. If your mattress is over 7 years old it may be time to get a new one. Pillows usually last for about a year before needing replaced. 9) Sleep during the night if possible. Daytime naps should be kept to a minimum, and should be 30 minutes or less. If you do nap then take a nap in the middle of the afternoon. Also try and let the sunlight awaken you in the morning if possible as this will keep you more in line with your biological clock. 10) If you continue to have difficulties sleeping then see your doctor. Sleeping problems are usually due to poor sleeping habits and not a medical condition. However, if you've tried the above tips and continue to sleep poorly then you may be suffering from one of many sleeping disorders such as sleep apnea, restless leg syndrome, narcolepsy, etc. I would also not recommend self-medicating until talking with your doctor as you may be covering up the cause of your insomnia instead of fixing it. 1 National Sleep Foundation. 2015 Sleep in America Poll: Sleep and Pain. Washington (DC): The Foundation; 2015 Mar. Available from: http://sleepfoundation.org/sleep-polls-data/2015-sleep-and-pain. Accessed 27 Jun 2015. 2 Oztürk L, Pelin Z, Karadeniz D, Kaynak H, Cakar L, Gözükirmizi E. Effects of 48 hours sleep deprivation on human immune profile. Sleep Res Online. 1999;2(4):107-11. 3 Institute of Medicine (US) Committee on Sleep Medicine and Research; Colten HR, Altevogt BM, editors. Sleep Disorders and Sleep Deprivation: An Unmet Public Health Problem. Washington (DC): National Academies Press (US); 2006. 3, Extent and Health Consequences of Chronic Sleep Loss and Sleep Disorders. Available from: http://www.ncbi.nlm.nih.gov/books/NBK19961/. Accessed 27 Jun 2015.